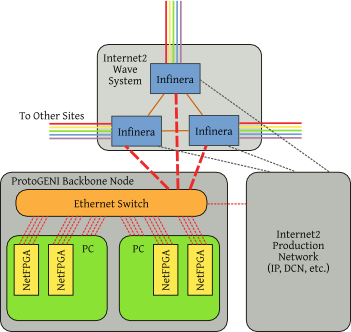 This page documents the design of the "nodes" that will be placed at Internet2 colocation sites as part of the ProtoGENI Backbone. These nodes will handle packet forwarding and routing at Layer 2 and above; lower level packet transit will be provided by Internet2's wave (DWDM) networks. Note: The above list does not include specs for optics for connecting to regional networks; the type of optics may depend on the particular regional. The number of interconnects between PCs, NetFPGAs, and switches will depend on the out-degree of the Internet2 site: some are degree-3, and some are degree-2. The switch at each site will have one 10Gbps Ethernet interface per out-degree of the site, connected to Internet2's DWDM equipment. Each PC will have at least one 1Gbps Ethernet interface per out-degree of the site, which will be connected to the switch. Similarly, each NetFPGA will have one interface per degree connected to the switch. Where more ports are available, we may increase the number of interfaces in order to utilize the inter-site bandwidth as fully as possible. At sites where Internet2 has an IP router, the switch will have a single 1Gbps fiber Ethernet connection to the router. This will be used to give each PC one IP address from Internet2's IP space; this will be used to get traffic from end users into and out of the backbone. (Since Internet2 currently does not carry traffic to/from the commercial Internet, this will limit end users to Internet2-connected institutions for the time being.) Each PC will have one network interface dedicated to this external connectivity, in addition to those listed above.